In Virginia following the civil war, African Americans struggled to assert their independence and make freedom meaningful. In the immediate aftermath of the war, many fled the countryside and moved to urban areas. This migration, along with the uncertain status of those African Americans who remained in rural areas, worried white landowners. Returning to power in the fall elections of 1865, white leaders enacted a series of laws known collectively as "black codes." These laws, which made a crime of vagrancy and turned such misdemeanors as petty theft into felonies, were designed mainly to ensure the availability of black labor. Black codes were enacted throughout the South. Teachers: Visit Teaching with Photographs for questions to ask your students about Jim Crow and Civil Rights. The United States Congress thwarted President Andrew Johnson's attempts to readmit the southern states into the Union quickly. Congressional Reconstruction replaced Presidential Reconstruction as Congress required southern states to ratify the Fourteenth and Fifteenth Amendments to the U.S. Constitution. Also as a part of Reconstruction, the former Confederate states were occupied by federal troops under the auspices of the Freedmen's Bureau. The bureau established schools and enforced contracts between former slaves and former slaveowners. Many former slaves became sharecroppers. Under sharecropping, landowners provided tenants with a portion of the crop in exchange for labor. In Virginia, sharecropping was most prevalent in areas where major cash crops, such as cotton, tobacco, and peanuts, were raised. In other rural areas, African Americans were more likely to work as farmers or farm laborers. Many owned land, although often their farms were so small that they had to augment their incomes by working as laborers, either on other farms or in rural industries. White attempts to reinstitute control culminated in the 1896 Supreme Court decision Plessy v. Ferguson. In Plessy, the Supreme Court upheld racial segregation under the doctrine of separate-but-equal. In all of the former Confederate states, constitutions were rewritten or amended to conform to Plessy. Virginia's Constitution of 1902 instituted poll taxes and literacy tests and mandated separate schools. Although Virginia public schools were racially segregated from the beginning, the Constitution of 1902 was the state's first constitution to require segregation. In 1904, the General Assembly gave streetcar companies the power to segregate passengers by race. Two years later, in the wake of protests and boycotts organized by African Americans in almost every major city in the state, the assembly enacted legislation that required racial segregation on streetcars. Excluded from the whites-only economic system, African Americans relied on each other. In every major city in the state, black businesses sprang up. Hotels, restaurants, theaters, and retail shops all existed in segregated urban areas. Maggie Lena Walker is widely known as the first woman to found and become president of a chartered bank in the United States. Her St. Luke Penny Savings Bank, however, was part of a larger network of businesses that both served and employed African Americans who would otherwise have been left outside the economic mainstream. In Richmond, the most important of these mutual-aid societies was the Grand Fountain of the United Order of True Reformers. Although African Americans were confined to the lowest-paying industrial jobs, the need to provide services to other African Americans led to the emergence of a black middle class that included physicians, lawyers, funeral parlor directors, teachers, and ministers. Although the Renaissance may have been centered in Harlem in New York City, the growth of black cultural life emerged in urban communities throughout Virginia as well. Beginning in the 1930s, black plaintiffs filed lawsuits to break down segregation at the graduate and professional school level. They also sought to equalize facilities in public high schools and elementary schools. These suits often focused on teacher salaries because these were the easiest disparities to prove. Between 1940 and 1954, many localities in Virginia were under court order to make separate educational facilities equal. In 1951, an equalization case arose in Prince Edward County, Virginia. Led by Barbara Johns, black students at Robert R. Moton High School staged a strike to protest the poor facilities at their school. The case, Davis v. Prince Edward County, became one of five that comprised the Brown v. Board of Education decision in 1954. The Brown decision overturned Plessy, and the implementation of Brown became a major goal of the civil rights movement. The civil rights movement of the 1950s, 60s, and 70s was just one part of the lengthy and historic struggle for black freedom. Although events in the Deep South may have been more compelling, Virginia was also in the nation's spotlight. Massive resistance originated in Virginia, and the NAACP filed more lawsuits in the commonwealth than in any other state. 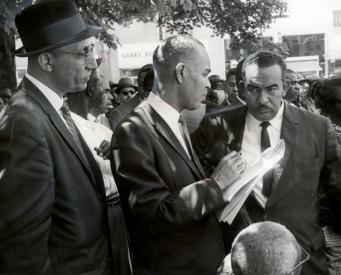 Many landmark civil rights cases originated in Virginia. As previously mentioned, Davis became part of the Brown decision. Fifteen years before the Freedom Rides, Virginian Irene Morgan brought suit to desegregate interstate bus travel. Another Virginia case extended this prohibition against segregation to include interstate bus waiting rooms and restrooms. Green v. New Kent in 1968 laid the foundation for school busing. Southern juries were desegregated as a result of Johnson v. Virginia in 1963. Loving v. Virginia overturned laws in seventeen states that banned interracial marriage. 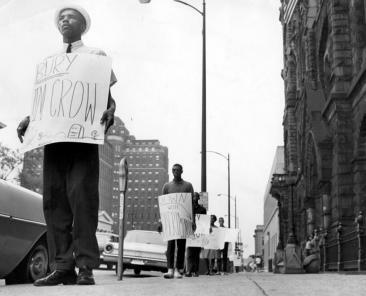 Although the lengthy and historic struggle for freedom continues, the civil rights movement did end Jim Crow. As they had seventy years earlier, southern states rewrote their constitutions to conform to the law as determined by the U.S. Supreme Court. The Civil Rights Act of 1964 and Voting Rights Act of 1965 helped make real the promises of the Fourteenth and Fifteenth Amendments. 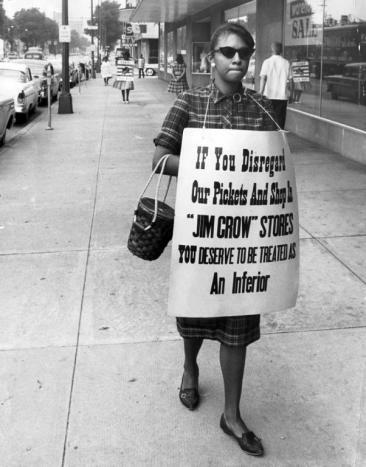 Protester with sign, "Bury Jim Crow"
Learn about how women in the early 20th century lived in Virginia.